Swip between primary colored (red, green, or blue) balls to combine colors. Red and blue turns to purple, red and yellow to orange, blue and yellow to green. 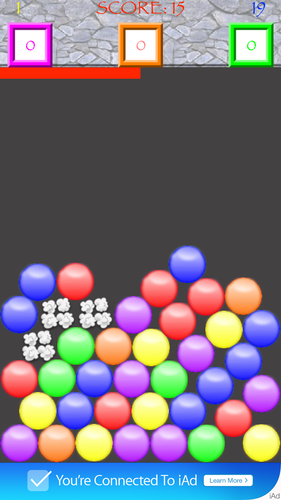 When three or more of the secondary colored balls are touching they will be eliminated. Earn bombs by getting four or more secondary colors touching. Use a green bomb to eliminate all the blue and yellow balls, purple bombs eliminate red and blue, orange bombs eliminate yellow and red. It seems easy at first but as you advance through the levels the balls come faster and faster. Can you keep up?